This debut YA fantasy sees a teen prepare to battle the ills of the world and the sinister force responsible. Seventeen-year-old Vida fled oppressive Russia for the more colorful San Francisco in 1962. There, she worked hard in school and started a family, hoping to keep alive the Sisterhood, a line of Druidic Priestesses begun in ancient Alexandria. Today, Vida is High Priestess of the Sisterhood and realizes that a planet ravaged by global warming, famine, and war must be saved immediately. 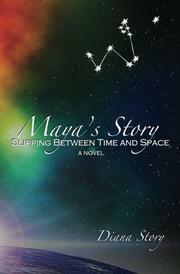 She starts training Maya, her 15-year-old granddaughter, three years early for the Sisterhood. Their mystical enemy is the Dark Menace that “stokes the fires that cause the atrocities that are increasing around the globe.” Ready to help Maya are the constellations watching from above, including Draco (Latin for dragon) and Monoceros (Greek for unicorn). Under Vida’s tutelage, Maya begins utilizing her heritage as an Indigo Child, practicing telekinesis and harnessing her ability to communicate with and transform into animals. The pair trains in the nearby forest, but Maya also learns to slip through adjacent realms to access sacred sites like Stonehenge, the Royal Library of Alexandria, and the temple of Queen Hatshepsut. But will Maya learn enough in time to halt the Dark Menace? In this mystically inclined novel, Story casts as wide a net as possible to round up the world’s troubles—including war in Syria and bees suffering colony collapse—for presentation to young audiences. Vida even quotes the Spider-Man comics when she asserts, “With great power comes great responsibilities.” While the bulk of Maya’s adventures take place in her mind, Story’s vibrant prose indeed slips between time and space; opening a casket in Queen Hatshepsut’s chamber reveals that “crystals glow from within, and the radiating colors bounce off the walls and ceiling in a riot of color that is almost disorienting.” Readers may need patience during the heroine’s extensive training, but once true danger arrives, it is followed quickly by horrific consequences. And though a vital Manifesto is delivered universally, humanity’s imperfection will require more from the Sisterhood. A lively and optimistic alarm bell regarding the fractured state of the globe today.